Your pulse can quickly start to race on ski tours, mountain tours or when climbing. 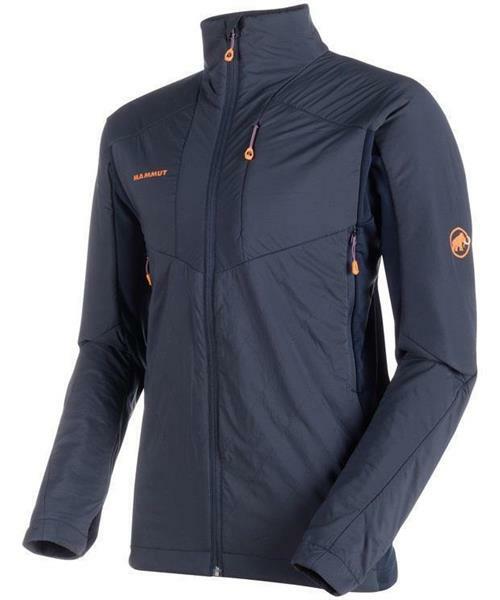 So in dry weather, a light outer jacket with good wicking properties is often all you need. Mammut's Eigerjoch IN Hybrid Jacket Men is a very breathable insulating jacket consisting of a water- and wind-repellent Pertex® Microlight outer material and a Polartec® Alpha® insulating filling for intensive stop-and-go activities. To ensure a comfortable fit, elastic Pontetorto® stretch fleece inserts have been integrated on the sides and under the arms and, for unrestricted freedom of movement when climbing, the Eigerjoch IN Hybrid Jacket Men also features our Mammut High Reach TechnologyTM. Elasticated cuffs with flat thumb loops give the wind no chance and the pockets are easily accessible even when wearing a climbing harness or backpack.